Category: Specialty Application “Hot” and/or “Cold” Vacuum Presses. From our beginning as a wood production company,Vac-U-Clamp has evolved into the world leader in specialty application vacuum press design and development. While we field a full line of stock vacuum presses, these are simply the product of over 20 years of innovative design and development in the Specialty Application Vacuum Press Technology field. Being the leader in both Hot and Cold Specialty Application Vacuum Press development, our vacuum presses are foremost in the areas of Vacuum Laminating Technology and Vacuum Forming Technology and are used for woodworking, wood forming, wood veneering, thermoforming, hot forming of components such as plastics and foil lamination materials, as well as any Thermoforming or Thermofoiling Specialty Application Vacuum process. 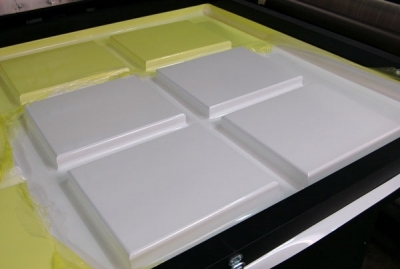 Our custom, specialty application vacuum presses can be used as a cold vacuum press, as well as heated “Hot” presses, so they are truly versatile and can be adapted to any specialty application of vacuum forming, vacuum veneering, thermoforming or thermofoiling. Custom Vacuum Press designed to handle a 5 ton stacked load for laminating architectural stone veneer on honeycomb panels with a special extra high membrane and a unique membrane support system that connects to a remote lifting device. FP/C 10500 a standard 5’x10′ hot press with a custom 24″ high (interior height) top and a 21KW heating package. Special use vacuum press incorporating a “super” flat 3/4″ aluminum platen and a special vacuum level control, a unique feature especially on an oil cooled pump.